Rattlesnakes are usually identified by their warning rattle (a hiss or buzz) made by the rattles at the tip of their tails. A rattlesnake is born with a button, or rattler, and acquires a new rattle section each time it molts. Rattlesnakes also are distinguished by having rather flattened, triangular heads. The heads of all Crotalus rattlesnakes are about twice as wide as their necks. Only pit vipers possess this head configuration. Rattlesnakes come in a great variety of colors, depending on the species and stage of molt. Most rattlers are various shades of brown, tan, yellow, gray, black, chalky white, dull red, and olive green. Many have diamond, chevron, or blotched markings on their backs and sides. Young or small species of rodents comprise the bulk of the food supply for most rattlesnakes. Larger rattlers may capture and consume squirrels, prairie dogs, wood rats, cottontails, and young jackrabbits. Occasionally, even small carnivores like weasels and skunks are taken. Ground-nesting birds and bird eggs can also make up an appreciable amount of the diet of some rattlers. Lizards are frequently taken by rattlers, especially in the Southwest. The smaller species of rattlesnakes and young rattlesnakes regularly feed on lizards and amphibians. 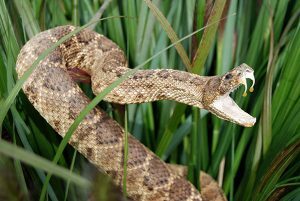 Rattlesnakes cannot spit venom, but the impact of a strike against an object can squeeze the venom gland, located in the roof of the mouth, and venom may be squirted. This can happen when a rattler strikes the end of a stick pointed at it, or the wire mesh of a snake trap. The venom is released involuntarily if sufficient pressure is exerted, as occurs when venom is artificially “milked” from live snakes. Such venom is dangerous only if it gets into an open wound. Always wear protective clothing when handling rattlesnakes. Female rattlesnakes are ovoviviparous. That is, they produce eggs that are retained, grow, and hatch internally. The young of most species of rattlesnakes are 6 to 8 inches when born. They are born with a single rattle or button, fangs, and venom. They can strike within minutes, but being so small, they are not very dangerous. Average broods consist of 5 to 12 young, but sometimes twice as many may be produced. The breeding season lasts about 2 months in the spring when the snakes emerge from hibernation. Sperm is thought to survive in the female as long as a year. During summer, pregnant females usually do not feed, so few are ever captured that contain eggs about to hatch. The young are born in the fall. Most rattlesnakes are mature in 3 years, but may require more time in northerly areas. Rattlesnakes may not produce young every year. The greatest danger to humans from rattlesnakes is that small children may be struck while rolling and tumbling in the grass. Only about 1,000 people are bitten and less than a dozen people die from rattlesnake venom each year in the United States. Nevertheless, it is a most unpleasant experience to be struck. The venom, a toxic enzyme synthesized in the snake’s venom glands, causes tissue damage, as it tends to quickly tenderize its prey. When known to be abundant, rattlesnakes detract from the enjoyment of outdoor activities. 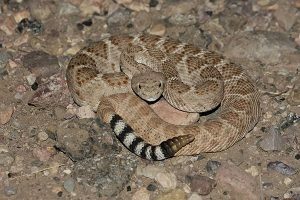 The human fear of rattlesnakes is much greater than the hazard, however, and many harmless snakes inadvertently get killed as a result. Death from a rattlesnake bite is rare and the chance of being bitten in the field is extremely small. 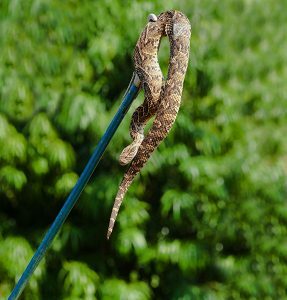 Experienced livestock operators and farmers usually can identify rattlesnake bites on people or on livestock without much difficulty, even if they did not witness the strike. A rattlesnake bite results in almost immediate swelling, darkening of tissue to a dark blue-black color, a tingling sensation, and nausea. Bites will also reveal two fang marks in addition to other teeth marks (all snakes have teeth; only pit vipers have fangs too). Rattlesnakes often bite livestock on the nose or head as the animals attempt to investigate them. Sheep, in particular, may crowd together in shaded areas near water during midday. As a consequence, they also frequently are bitten on the legs or lower body when pushed close to snakes.